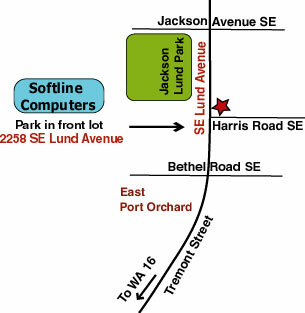 Softline Computers is an all purpose computer shop. We have been serving Port Orchard and surrounding areas for over 25 years. We debug your computer and make it run as good as new, troubleshoot and fix hardware issues and build a new computer for you if desired. We are not proud, if a custom computer is not needed we will be your consultant and tell you how to buy an off the shelf computer from the big box stores or just recommend what we feel is a good laptop. Our prices are affordable and our work excellent. Call us at 360-895-2227 or come in.